So it is finally bound, and I thought I’d have permanent eye strain. It is bound in solid black, and yes, with black thread. Holy cow, am I glad it is finished!! If you want to see it from the beginning click HERE. I had to put two lamps next to my chair to see the binding as I went. Are you still with me? Now I need your help. I have two questions for you to answer, and there will be a drawing for a video as a prize. Just leave a comment with your opinion to be entered. The drawing will be random, so even if you don’t have an idea or opinion, you can still win. I have to put a sleeve on it for showing, and I am conflicted now about the orientation. The original idea was 4-3-2-1-2 coming down like a waterfall from the top left, with four down, then three down, then two down, then 1 at the bottom, and two next. But to me looking at it this way, do you read across instead of down into 3-3-2-1-1-2? Is that what you see, or do you see the waterfall? Call this way Option A. So, here it is with the other end up, Option B. Now it reads 2-1-1-2-3-3, or do you see 2-1-2-3-4? I asked the longarm ladies on the forum and got a mixed response. Some like the heavier block end at the bottom, saying it is more natural to put the larger grouping at the bottom. But others like it in the original waterfall setting, saying it is opposite of traditional so should be placed in a non-traditional way, more artistic expression. And I need a name for the setting design. So, which do you like better? And what would you call the setting design? 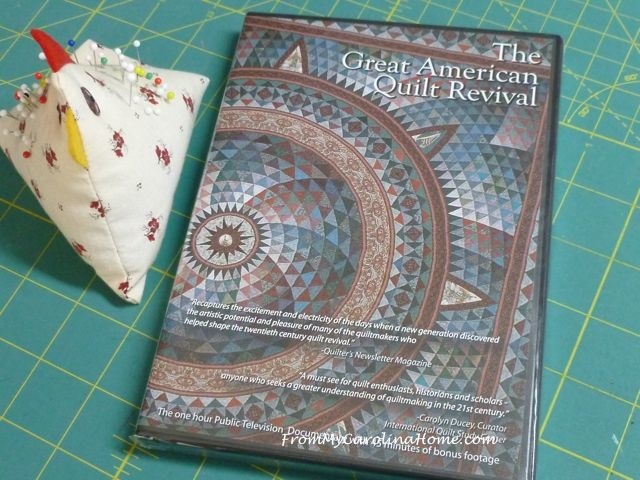 Comment on setting name and/or which way it should hang to be entered to win this Public Broadcasting produced DVD on the Great American Quilt Revival. (Giveaway has been done). The Great American Quilt Revival is the story of how quilts came to be recognized as works of art and how the craft of quilting has exploded into popular culture. It has a one-hour show plus 45 minutes of bonus footage and interview. I don’t know if it will play in DVD players outside the US, I assume it to be Region 1, although it doesn’t say. If you are international, I’ll send a book instead, so comment away! Update – I have been thinking about this all day, responding to all the comments, and then got this brainstorm. I think I might call it Shooting Stars, the black being the night sky. Or maybe Falling Stars. If you don’t have an opinion on the questions, comment anyway, you’ll still be able to win the DVD if your number is chosen by the random number generator. So, what do you think? Option A It, to me, is much more dramatic with Option A. Option A. Just the feel of the groupings, very nice. For some reason, I like option B, don’t know why. Definitely Option A for me. Shayna Shipley @ Wife. Mom. Creator. I really like option B.
I like Option A, and I would call it Pinwheel Falls. Love this arrangement. Great job. Would love the DVD. And I really like your pin cushion. I think I have a Pattern for that somewhere. Thanks for the opportunity to win. Option A is my choice. To me, it gives length to the quilt. Whereas, Option B is compact. Option A…looks more “contemporary” as a hanging. But don’t ask me, I am a beginner beginner…still learning to spin a bobbin. Oh my you are still getting mixed reviews. Now, please don’t take offense, but it doesn’t remind me of a waterfall at all but of tumbling rocks….it think it’s the movement in all your blocks that reminds me of the tumbling. (Still love the stainglass look of so many of these blocks.) Hey!How about Tumbling Glass Blocks??? Either way but i like Heavy on top. Could be because that is how i saw it first. I like the three corner blocks in the upper right as in your first photo, making the bulk (heavy) in the lower left. Not one of the options you show as A or B. Great looking quilt! After spending quite a bit of time, looking at it from various angles and such, I prefer option B. 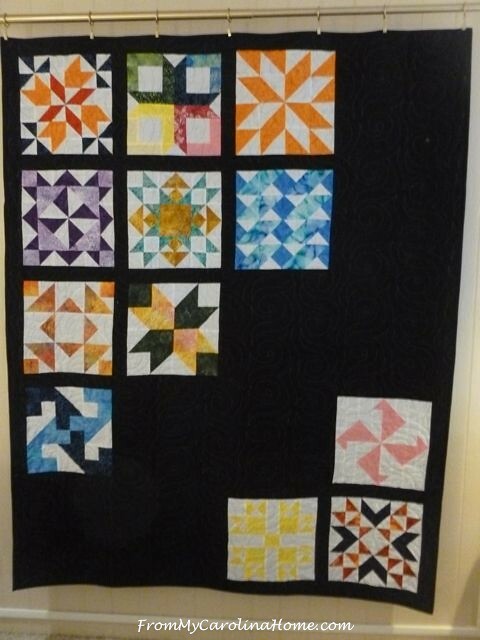 When looking at option A, I feel so many of the individual blocks are “lost” instead of looking at each block element and what it brings to the quilt, I repeatedly see just one. 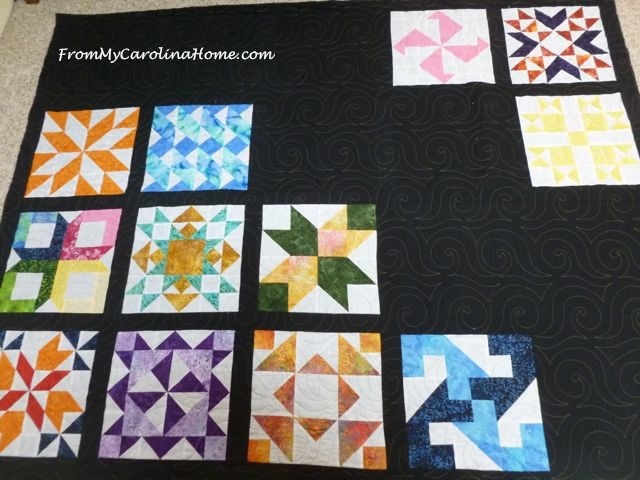 While with option B, for me, it was pleasant to stop and admire each and every block and how they all work together to form the whole quilt. As for a suggestion for a name, I have never been good at naming quilts, but Enchanted Melodies actually just came rushing into my mind. I enjoyed looking over each of your blocks, your fabric choices and settings. I give you two thumbs up for letting your creative style come out and trying a whole lot of variety in every aspect of this quilt. It really is wonderful! Thank you for sharing and inspiring! Have a wonderful day! Lovely, no matter how you look at it! I like “B”; the three blocks in the corner reminds me of a tetris piece, getting ready to rest snuggly against the larger group to form a rectangle (and I want to hit the ‘move right’ button, so it moves properly in place!). It is easier for me to take in the detail of the blocks by first appreciating the three, then moving on to look at the blocks in the larger, lower portion. I like A. Can’t help you with a name. Sorry! 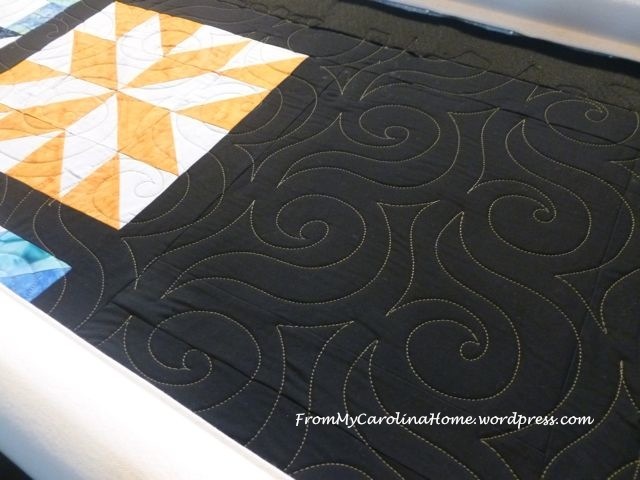 Oooh…I like this setting and I love how the quilting shows on the black. I like option a, I’m calling it midnight stroll through the garden. Nice work!! I like A too and don’t know what name to give it. I have been thinking about this all day, responding to all the comments, and then got this brainstorm. I think I might call it Shooting Stars, the black being the night sky. Or maybe Falling Stars. I prefer option B but it works either way for me. I think of this kind of setting as a grid with “missing blocks” in the negative space. I like B best. for a name which I really stink at btw ‘Across the Midnight Sky’. I think I like option A the best, but really like both, so either works. I think of “Tumbling” when I look at it. I like option A . Option B looks bottom heavy to me, yet option A doesn’t look top heavy to me. Option B, with heavier/more blocks on the bottom. How about Waterfall or something with waterfall in it for the name? Since that was your inspiration for part of it. I prefer the first option, although I don’t see a waterfall. It’s B for me. The blocks just seems to flow better and feels more natural. Funny how our brains respond so differently. Also, it reminds me of the video game “Tetris.” Maybe call it “Tetris Sampler.” Oh, I just re read the comments after I posted and saw someone else refer to “Tetris.” Hmmm I am feeling a connection! My eye reads Option A top down, so I think I would prefer to see it as in the photo directly under the blog header. To me, Option A looks top heavy. As for the name, why not use the word Waterfall in the name since that was what actually inspired you in the first place. This is a lovely quilt! Nice job! I vote for option B for it’s illusion of movement. It looks like the three blocks are moving into position on the larger rectangle. I don’t see waterfalls at all, but Falling Stars is kind of nice. I might call it “Fitting In” for the tetris-like illusion, but that’s me. Whatever you call it, it’s lovely! Option A and Meteor Shower or Cosmic Delight . I’m over here marching and going my own trail: Landscape the quilt, heavy blocks on top, so it looks like ALMOST all the blocks have ‘floated’ up to join the others, overjoyed! What did they put in my Yin Hao Jasmine tea this morning? 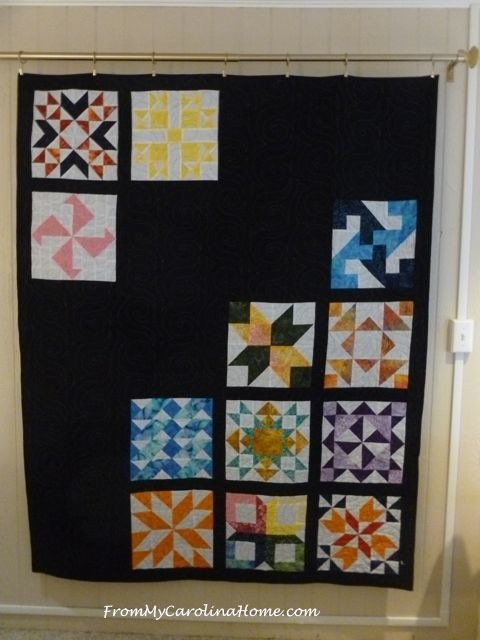 Great quilt and layout. I huffed reading black fabric black thread….it IS boggling to the eyes…but such fantastic results. Really super.